Objects found on a battlefield can provide curators and historians a human connection to the subject they are studying. These objects often become artifacts and find a home in a museum for public display. One such item is a Civil War belt plate that was recovered from a peach orchard once owned by Joseph Sherfy. The orchard was located on a small ridge along Emmitsburg Road, about a mile and a half south of Gettysburg, the scene of heavy fighting in the late afternoon of July 2, 1863. Who did this belt plate belong to? How did it get here? And what significance does it have in telling a bigger story? Fighting at the Peach Orchard occurred on the second day of the Battle of Gettysburg. Major General Daniel Sickles had posted four batteries there after advancing his corps off of Cemetery Ridge. The extra ground he occupied badly overextended his lines and Confederate Lieutenant General James Longstreet’s attack on the Federal salient there resulted in desperate fighting. Sickles’ attempt to halt the Confederate attack by feeding his regiments into the action piecemeal resulted in the collapse of the Union position. 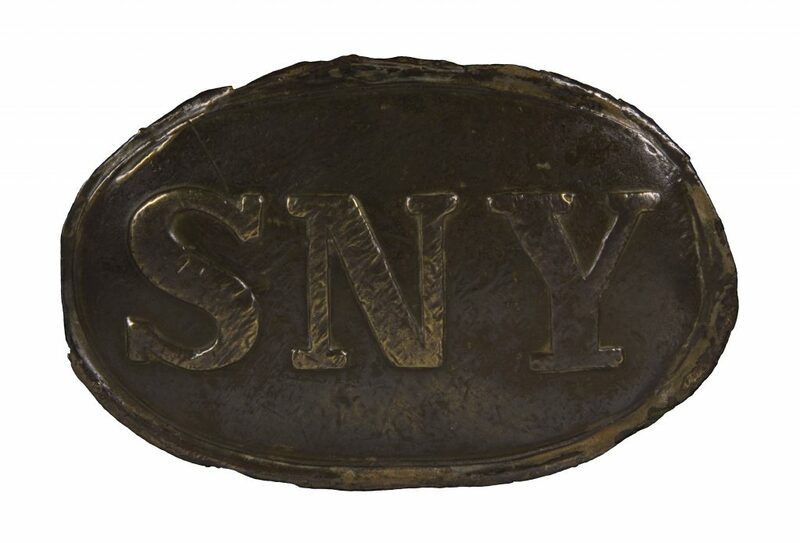 One of Sickles’ units defending the Peach Orchard was the 73d New York Volunteer Infantry whose Soldiers may have worn “SNY” (State of New York) marked belt plates. Made of brass, these small oval plates were sometimes die stamped with raised letters identifying a Soldier’s home state. More common were the “US” stamped belt plates. The 73d New York Volunteers, or “Fourth Excelsior,” was organized July-October 1861 in the Bowery neighborhood of New York City and was dubbed the 2d New York Fire Zouaves. At Gettysburg the 73d fought in the Peach Orchard and surrounding area, suffering the casualties of four officers and 51 enlisted men killed, 11 officers and 92 enlisted men wounded, and eight missing. After the battle, Joseph Sherfy returned to his orchard only to find it in ruins with decomposing horses, bullets lodged in his peach trees, and remnants of items left behind by Union and Confederate Soldiers. Although not identified to a particular Soldier, this belt plate likely belonged to a member of the 73d who fought at the Peach Orchard. This small item is a link to the past of a major action in one of the most historic battles of the American Army. It will be on display in the “Decisive Battles” section of the Preserving the Nation Gallery in the National Museum of the United States Army.